Sometimes, it's just meant to be. Another gal and I have been handling the estate of some dear friends. off site in order to accommodate the pure volume. even entered to begin their process. we wanted at half off, that I saw it. which is a little odd since it was Bob's mom who did more stitching. But Shirley's mom liked to cook and appreciated food. I don't know this ~ it's just a hunch. 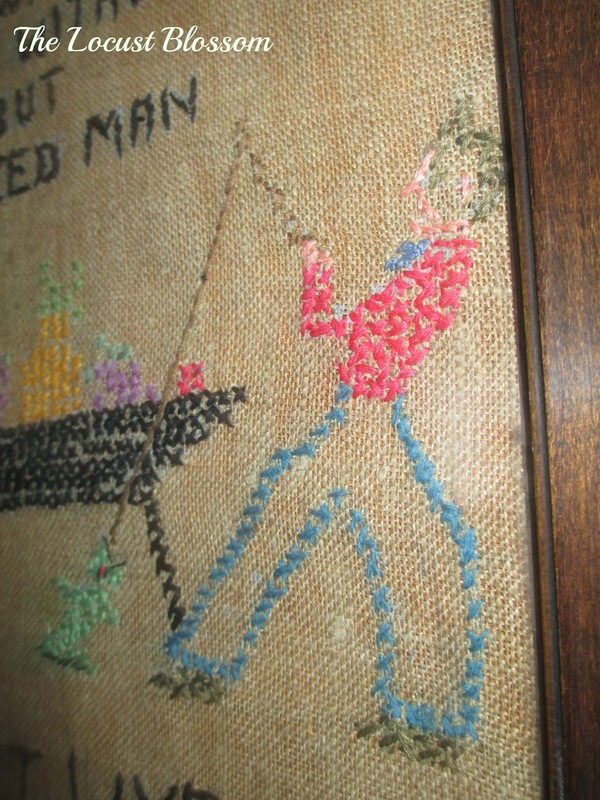 The other fun bit is that the fella has a fish on his line. Mr. LB being the avid fly-fisherman he is was pleased to see that. There are so many things that were hiding, packed away. I would have loved to have asked questions. forgotten relics from our own home. I am thankful to everyone who looked at this piece and passed it by. It is now hanging in our kitchen ~ right where it belongs. It obviously was waiting for you to love it which is why no one else bought it. Some things are just meant to be. It's a charming little stitchery and I can see why you love it. 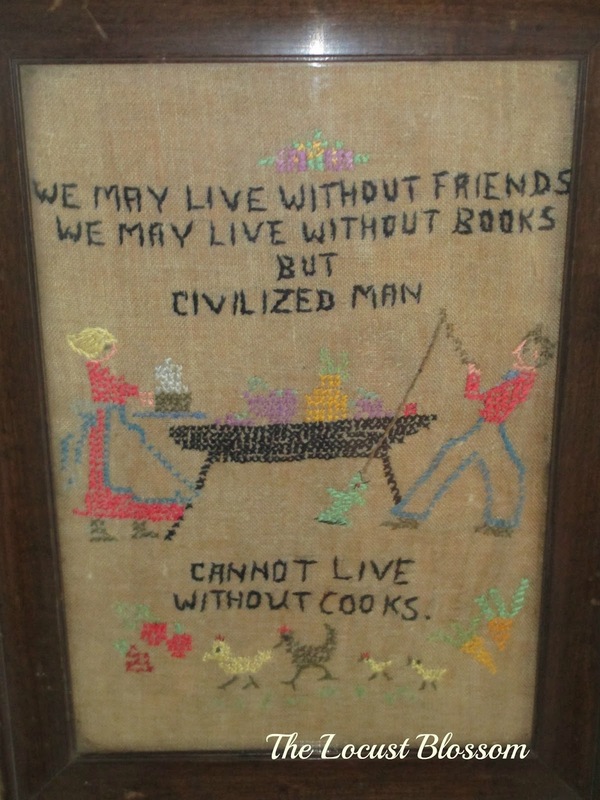 A wonderful embroidery. It was meant to be yours. What a nice way to remember them! I always liked the little, personal things. It will have a good home with you. What an adorable sampler - love it! (hope you don't mind my leaving a comment here...) Just dropped by to let you know the blog post listing over 30 great homesteading/simple living sites (including yours!) sorted by state has been published. What a great resource for all our readers! I'm hoping all the blogs included on this list will share it on their site too for their readers to enjoy, as well as sharing on social media. Here's the link --> http://taylormadehomestead.com/homestead-sites-state/ Thanks!